With the sun blazing overhead, the crew of Native American youth tries to work quickly. Their hands are covered with dry, cracked mud as they repair the stone walls that make up one of the more prominent cultural sites at Bandelier National Monument in New Mexico. 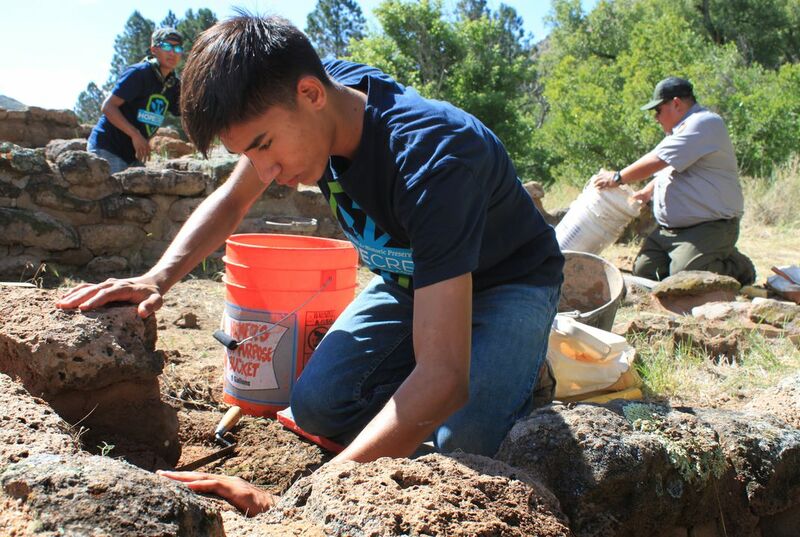 The teens spent most of the summer helping with a massive preservation project. It is part of the National Trust for Historic Preservation's HOPE initiative, or Hands-On Preservation Experience. 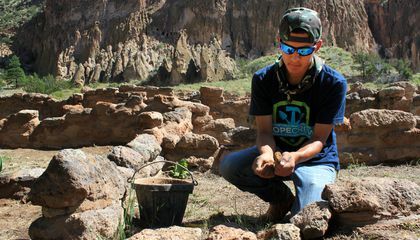 The trust teamed up with the National Park Service and the Rocky Mountain Youth Corps. The goal: To train more young people in preservation skills while helping historical sites on public land. From New Mexico and Arizona to Virginia and Vermont, crews worked on some 30 projects this summer. At Bandelier, the work has taken on a greater significance. That is because the teens are restoring structures that were built by their ancestors centuries ago. "I think it's important because we need to know where we came from," said Vidal Gonzales, 17, of Santa Clara Pueblo. Tucked into northern New Mexico's ancient canyons, Bandelier has a long human history. It stretches back more than 11,000 years. Back then, nomadic hunters and gatherers tracked wildlife across the region's mesas and canyons. More permanent settlements popped up several centuries ago, and the largest concentration was in Frijoles Canyon. All that's left now are the stone and mortar outlines of what were once grand multi-story structures. They were built into the walls of the canyon and along Frijoles Creek. There are underground kivas where puebloan ancestors gathered for meetings and ceremonies. And prehistoric warehouses made up of hundreds of rooms, where food was stashed. Tyuonyi Pueblo is one such place, where the all-tribal HOPE team worked. The team checked the capstones of each wall. If loose, they were removed, the mortar was replaced and the stones were reset. Measurements were taken and the work was documented. The site was first excavated by Edgar Lee Hewett in the early 1900s. In 1916, Bandelier was established as a national monument. Without the maintenance, Bandelier preservation specialist Jonathan Stark said the walls would crumble. They would come down within a decade or two. "The work that we're doing is important to a variety of people," Stark said. "Obviously, the visitors love coming out here and seeing this and learning the history of a place such as this. To the descendants, this is a footprint of their ancestors, something that proves they were here. It gives perspective to their younger generations." Myron Gonzales is a San Ildefonso Pueblo member who led the crew. He said the teens learned skills they can use to round out efforts in their own communities for preserving cultural sites, language and other traditions. "The biggest factor in developing what they're doing now is being able to provide them with a means of identification," he said. "We come from pueblo communities where, in today's society, language is being lost and we're at a crossroads." The crew was recruited by the Rocky Mountain Youth Corps, which provides stipends and scholarships. It plans to recruit more tribal youth to work on possible future preservation projects with Acoma Pueblo and other Native communities in New Mexico. Why are teens motivated to do this work? A place called Hope is built and it is used to have teens have a hands on experience with fossils and other things they can find in the ground. That place is a good place to send your teenage kid because it gives them a place to relax and a place where they don't play games all day and be on the social network. I think this cool because it is going to take a long time to repair the stone walls people built almost 11,000 years ago. It is going to take a long time because they have to figure out how people back then made it and use the same material they used to make the walls. It is going to require complex research since there is not much about the walls. Answer: Teens are motivated to do this work because they want to know where they came from. Because they want to help the environment? I hope I can do that one day.???????????? I wonder how it long it will take to build the stone wall? the teens are motivated to do this work because they want to learn more about where they come from and help preserve it.